BlackBerry OS 7 devices are here (or at least on their way)! 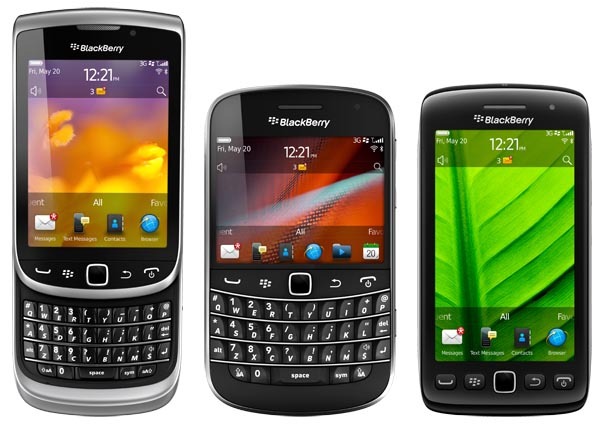 The BlackBerry Bold 9900/9930, BlackBerry Torch 9810, and the BlackBerry Torch 9850/9860 devices are soon to be hitting the shelves in a store near you. Up north, our Canadian colleagues have already managed to snag some of these next generation BlackBerry smartphones for themselves. The rest of us, though, we wait anxiously for our chance to buy one of these OS7 devices. How long that wait is depends entirely on your wireless carrier and desired device. Scouring the blogs for this information can be a bit daunting; so we did the work for you. After the break, you'll find our list of six seven major carriers in the US and Canada along with the devices they are rumored to carry. Unless otherwise noted, the information isn't official from the carriers and thus subject to change. Prices listed are promotional pricing only; purchasing a phone off-contract will, of course, cost more. Verizon BlackBerry Bold 9930 pricing leaked! T-Mobile launches the BlackBerry Bold 9900, its first 4G BlackBerry smartphone! BlackBerry Bold 9900 now available from T-Mobile! Leaked screenshots show Bell release dates for BlackBerry Torch 9810 and Bold 9900!